Help me choose: WIP it or RIP it? 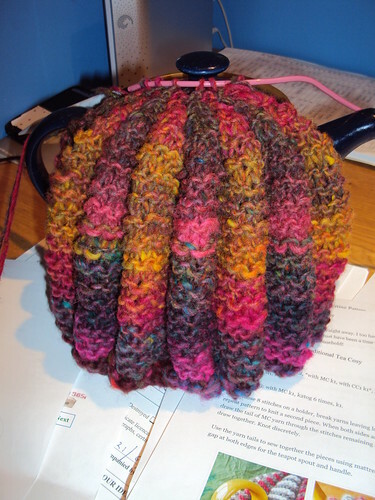 You may recall I was all set to resurrect a WIP from earlier this year – Calyx Hat by Debbie New – to make a multi-coloured tea-cosy for my daughter’s teacher (on request!). There was the small matter of re-jigging the maths to make it fit a tea-pot, rather than a head; but that was easily got round. Once the cast-on stitch-count was triple-checked (with stitch-markers in place like there’s no tomorrow) the actual knitting was very quick: one evening’s sitting, in fact. The sewing-up was an altogether different matter, however; but we’ll come to that later. 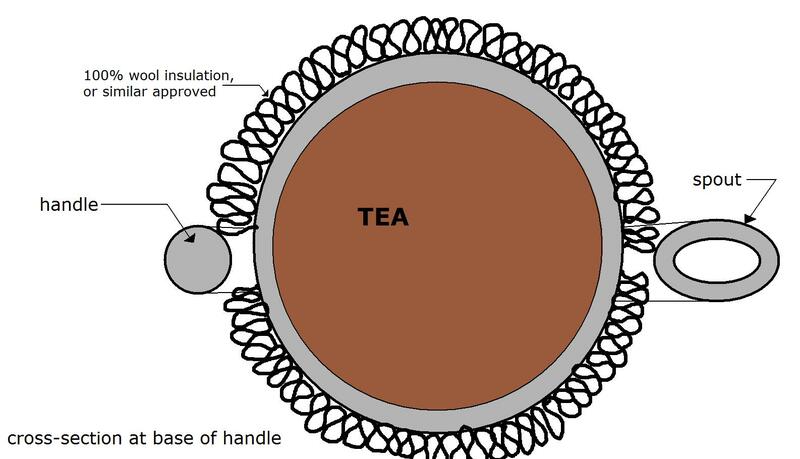 Which, we agreed, is quite appropriate, considering a tea-cosy is insulation for a tea-pot. So far, so clever. Then, that minx, Hubris, came to the tea-party and spoiled all my fun! 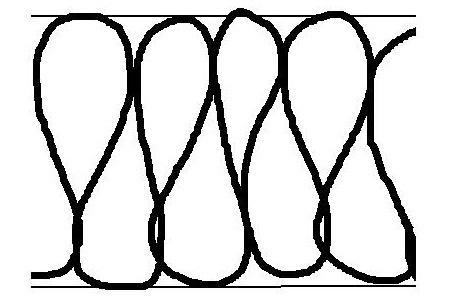 As I was happily sewing-up the lobes, I created a mathematical imponderable – a twist that would not go away. At the same time, I fell out-of-love with how the Noro striping was becoming a murky melange over such a large stitch-count. You know when you’ve made something really clever in plasticine and then the mean-kid comes and mushes all the colours together so that it looks like muck? That was what my hat was like. It was an easy decision to rip and start again. 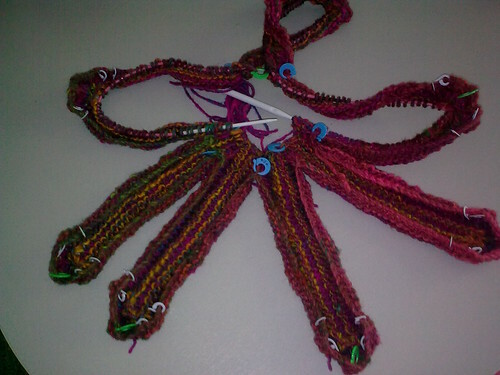 Same wool, I decided – after all “multi-coloured” was part of the Brief. 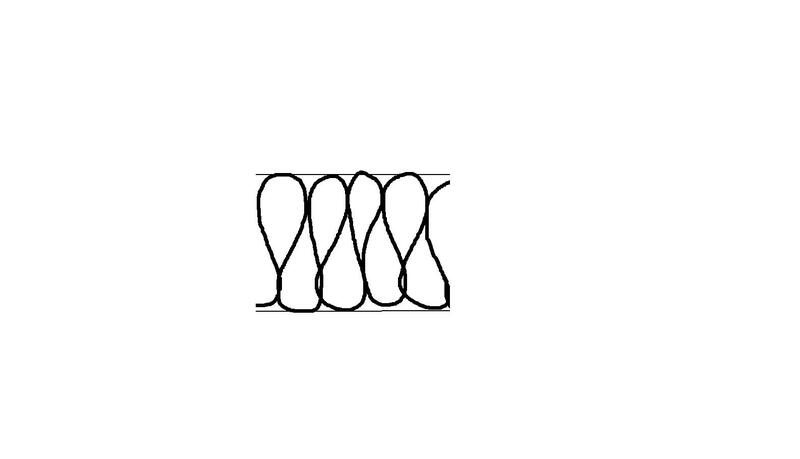 My pattern choice should instead let the striping of the yarn play with a shorter stitch-count giving deeper stripes. I went for a classic: the “traditional” fluted tea-cosy pattern. My sister knit one of these when we were in Primary School but I never got the chance. You may be surprised to learn that I didn’t automatically know how it was made – I had to look it up. First I disliked it, then I revisited. Now I love it! Deliver it with attitude and it’ll be a winner! I love how this pattern shows off the striping so well – going from cold At the bottom to hot at the top like a fire! My rule of thumb is would I like to receive this – which usually results in my having to buy two of things – one to gift and one for me! Anyhow I think it’s far more unique than any soap sets or whatever else it is the teacher will get! But, that’s not to say it’s not nice, different strokes for different folks and all that. God, I feel bad saying that. All knitting is beautiful really. Just some yarns are better suited to other patterns? Ok, I’ll put my shovel away now. I’m in two minds about it. At first glance, I was inclined to agree with Sinead, but now I’m not so sure. It does have some ‘attitude’! I kinda like it. I think it needs that OTT finishing touch like a pompom or tassle on the top. You need to go all the way with this one! I have a love/hate thing with Noro. I want to love it’s wooly goodness, but the striping doesn’t always work for me. 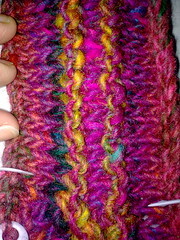 I think I am too much of a control freak for self striping yarns. The teacher wanted a multi-color cozy, this certainly fills the bill. The striping on alternate ribs almost makes it look woven as well as knit. I say give it. Thanks for you comment. I love how this WIP is getting such mixed reaction. I gave it to the teacher and, according to DD, it was genuinely well-received. A Cadbury’s Caramel sweet was sent home with DD by way of thanks!